Hélène Cixous has described the act of writing as becoming “a thing with pricked-up ears.” She describes doing this work at night: “night becomes a verb. I night.” By turning ugliness into a verb, as Cixous does with night-time, this chapter considers what it might mean “to ugly” when writing. 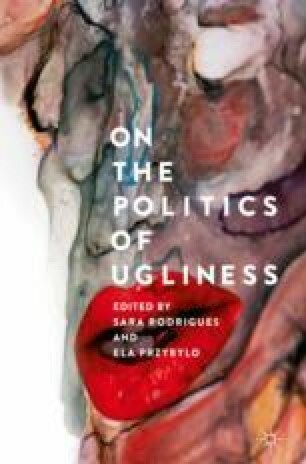 It explores the experience of inhabiting unsettling, resistant, anxious, uncomfortable—in other words “ugly”—spaces whilst writing. It makes a case for the value of encounters with the ugly in one’s writing practice and how abiding with, or deliberately turning towards such is not only a sound method of working but provides an important counter narrative to the social drive to rid ourselves of the unpleasant. It asks: What is “ugly” writing? What does it mean “to ugly” in the context of writing? And in what ways might considering ugliness as part of one’s writing practice enable a renewed thinking about what it is to write? Drawing on philosophy, psychoanalysis, and literature, this chapter makes a case for the veracity of ugliness—not only politically but also as a methodology or practice. Ronell, Avital. 2014. The Telephone Book @ 25 – Friday Concluding Remarks: Avital Ronell. https://www.youtube.com/watch?v=mc4J_SoMYqk. Accessed 5 Jan 2017.